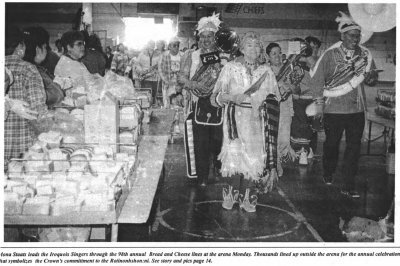 "Mona Staats leads the Iroquois Singers..."
Mona Staats leads the Iroquois Singers through the 98th annual Bread and Cheese lines at the arena Monday. Thousands lined up outside the arena for the annual celebration that symbolizes the Crown's commitment to the Rotinonhshon:ni. See story and pics page 14.